Funeral service for Nellie Ruth Richter, 84, of Cullman, will be at 2 p.m. on Wednesday, March 27, 2019 at Cullman Heritage Funeral Home; burial at Cullman City Cemetery. 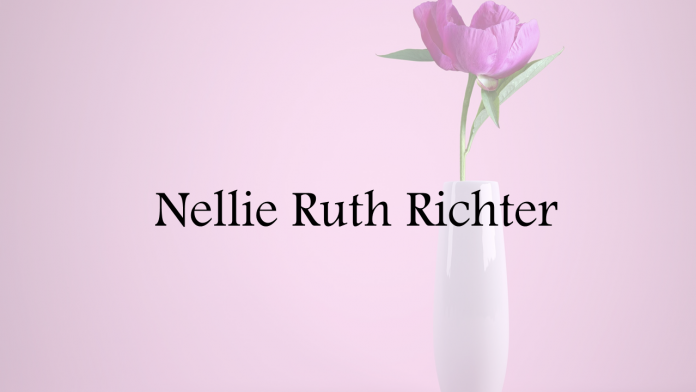 Mrs. Richter passed away on Saturday, March 23, 2019 at her residence. She was born, August 26, 1934 to C.W. and Reba Bessie Bates. She is preceded in death by her parents, first husband, Hobert Dye Sr., son, Hobert Dye Jr. and brother, Lloyd Bates. Survivors include her husband, Louie Richter, daughters Carolyn (Daniel) Fincher, Vanessa (Tim) Willis, and Regena Richter, son Greg (Laura Axelrod) Richter, grandchildren, Danielle Fincher, Billy Fincher, Michele (Jason) Heaton, Robert Willis, Ashley Richter, John Stevens, Shelton (Ashley) Stevens, and James (Courtney) Fullard, 12 great-grandchildren and a host of nieces, nephews, family and friends. Visitation will be from noon until 2 p.m. on Wednesday, March 27, 2019 at Cullman Heritage Funeral Home.